DA leader Mmusi Maimane wants President Cyril Ramaphosa to cancel all Bosasa contracts immediately. 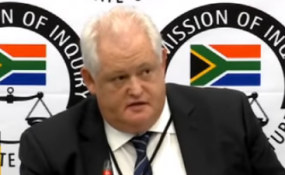 In a statement issued on Thursday, Maimane said that the first day of testimony by former Bosasa chief operations officer Angelo Agrizzi "shone a new light on how totally corrupt the ANC government is". "Given this truly explosive testimony, I call on President Cyril Ramaphosa to instruct his government to immediately cancel all contracts and tenders with Bosasa and place a strict moratorium on any new contracts with the company or any of its subsidiaries," the statement reads. Maimane reiterated a call for Ramaphosa to establish an independent inquiry aimed solely at Bosasa, which is now known as African Global Operations. "The fact is that Ramaphosa received a R500 000 'donation' from a company that has been paying the ANC bribes since 1999. He can no longer mislead the public into believing that 'he did not know'. "He is also on the record as having told Parliament that his son, Andile Ramaphosa, does lucrative paid work for Bosasa. "All of this appears no different to every other Bosasa bribe to the ANC since 1999," Maimane added. Maimane said Ramaphosa was asked when he would be "paying back" the R500 000 campaign donation from Gavin Watson, the Bosasa CEO. "Ramaphosa cannot play both sides. He cannot condemn state capture and set up inquiries into other ANC corruption, but avoid the same inquiries when the corruption involves him."